I stumbled upon this site and I just think it’s awesome. It got me thinking that I am going to introduce a new bargain site of the week every Sunday. And this is my first one. Of course I’m hopiyou will help by forwarding a great site you find. Let’s start with this new site. YaySave! 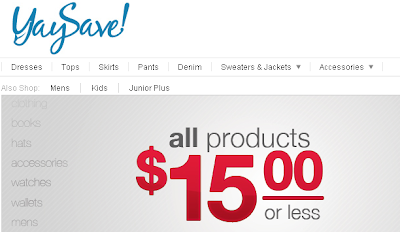 has a big selection of brand name clothing & designer labels all for only $15 each. That’s right, everything is $15. Like this MARCELLE RENEE Suede Coat. They have demin, dresses, handbags, outwear, jewelry and more. And the cool thing is, right now with every item purchases, you get a 10 Free Swagbucks. How cool is that. Go here if you would like to check out this site. You won’t be disappointed.